[Stride]-Stride Step-[Choose one or more cards with the sum of their grades being 3 or greater from your hand, and discard them] Stride this card on your (VC) from face down. 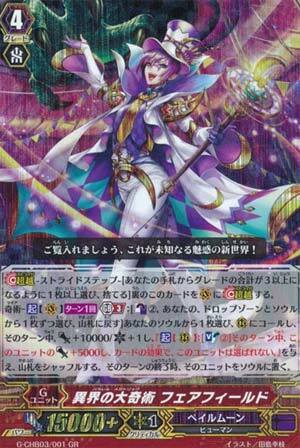 Magia-[ACT](VC)[1/Turn] Generation Break 3:[Counter Blast (2) & Choose a card from your soul and drop zone, and put them on the bottom of your deck in any order] Choose a card from your soul, call it to (RC), until end of turn, it gets [Power]+10000/[Critical]+1, and "[ACT](RC):[Soul Blast (2)] Until end of turn, this unit gets [Power]+5000, and this unit cannot be chosen by card effects. ", shuffle your deck, and at the end of that turn, put that unit into your soul. Right, so Rummy Labyrinth's newest toys are about to hit the shops on Friday, so to give people an idea of what to expect, I'm (we're? Where the hell is Winston anyway?) covering their newest toys. Fairfield here has an ACT Magia that's GB3: CB2 and return a card in the drop zone and soul to the botom of the deck to call a unit from the soul, vanish it at end of turn. The called unit gains 10k plus a Critical, and a skill that lets it gain another 5k on attack as long as you Soulblast 2. And as a bonus, it can't be chosen with card effects. Eh, I can sort of see where you're meant to go with this, powering up Darkside Princess to ridiculous levels for a killer blow, but really, I'm not an immediate fan. I feel like for a Counterblast that big, it's putting too many eggs in one basket. Soul is precious in Pale Moon. Sure, Cutie Paratrooper and Flying Peryton can net you excess that you can Soulblast away, but if I wanted a finisher, I'd rather go with Dragon Masquerade Harri. For the same timing I can keep my soul and multi-attack if done correctly. Just about her only use is if you know a Denial Griffin or similar is about to get thrown straight into your face. A one-of that invites a Perfect Guard for one column or neuters hand trap. Aside from that, it won't see much use.